Scouting is an act of getting information and acquiring a database of other teams to see what and who will be valuable for an alliance. Scouting not only provides information about other teams for us, but is also a useful source to share with allied teams for the FIRST competition. Fundamentally, scouting is the observation and analysis of other teams' activities, records, and scores from the past competition. It is a means to make us a respectable competitor and opponent by collecting this data. Doing so gives our team a better idea of how high ranking teams are playing as they are, and how we can reform our current methods to be a more successful team. Scouting gives us a leg up on the other teams who have not done any research, as they will not know the competition well. We can use our scouting information to create game strategies against teams on whom we have allocated data. A team can scout by looking up records online, conversing with other teams, or taking notes during a competition. 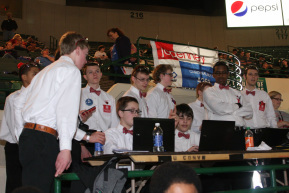 Some Scouting methods include such things as recording past scores for other competitions, discussing histories of other teams, and graphing data to predict upcoming scores.